Halifax customers have been hit by a power failure affecting all branches, cash machines and online banking. The bank said an external power disruption at an IT centre in Yorkshire caused problems to a range of Halifax and Bank of Scotland (HBOS) services. Power has now been restored, and the company says systems, including cash machines, are now running. Internet banking has also been restored, having been affected by the earlier problems. 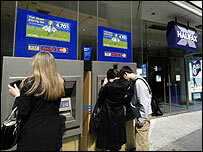 An HBOS spokeswoman said: "We apologise to customers for the disruption and inconvenience this is causing." Branches were open this morning, but it was only possible to withdraw money at the counter service, where staff were writing transaction details down on paper. HBOS cash machines were out of service, and customers had also been having their cards rejected at the cash machines of other banks, and in some shops. A spokesperson said cash machines started working again at 1430 GMT and bank cards are again being accepted at shops and at other banks' ATMs, as usual. At one branch of Halifax in London, this morning, customers were greeted at the door by a manager telling them that "all banking services are down". Appointments were being cancelled, because staff computer systems were not working, and customers were only allowed to withdraw a maximum of £200 because the bank could not check their account balance. An HBOS spokesperson said: "Power was restored to the centre via our back up generators in the late morning and all systems, including cash machines, are running normally as of 1430."